This article contains the stats, strategy, and guide for Saber - Okita Souji. We will update this as soon as the game comes out. Okita Souji is an elite swordsman and also the first captain of the Shinsegumi. She battles for the Holy Grail in hopes of being able to fight to the death. 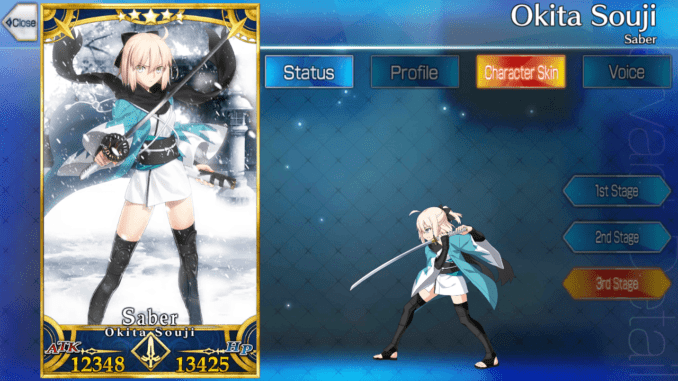 Okita Souji appears in Fate Grand Order as a 5 star Saber class servant. Similar to Julius Caesar, she also has a Quick-focused skill set which makes her ideal as a Crit Cannon in comparison to the other Sabers. 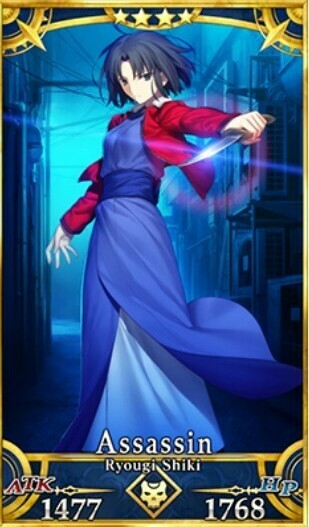 Similar to Ryougi Shiki Saber, Okita Souji’s sword is a katana as that was she was trained with all her life. Also nicknamed the “Sakura Saber” due to her being a Saber face, she also appears as the servant of Kohaku in Fate/ KOHA-ACE. Okita Souji made her debut during the GUDAGUDA Honnouji Event 2017 and appears only as an event servant in FGO. 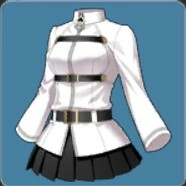 Okita Souji deals around 5 hits when using Quick Cards, making her ideal as a C. Star farmer. Alongside Jack the Ripper, both servants can farm C. Stars. 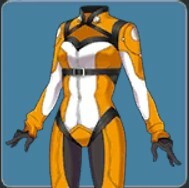 Unfortunately, this slightly limits their ability to build their NP Gauge unless fighting an enemy that has a class affinity disadvantageous to. 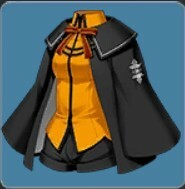 Since she can be a little squishy, Okita Souji might need an accompanying tank. If you’re keeping the whole Quick Card build, bring Cu Chulainn who has Guts and Divine Protection of Arrows. Or, you can also bring Marie Antoinette who can heal with her Noble Phantasm and cast Invincibility on herself. She also some Quick Cards which can help continuously make Quick Chains to gather more stars. For an Arts/Quick Team, players can support Okita Souji with Hans Christian Andersen and Mash Kyrielight. Hans, being the cheaper alternative to Zhuge Liang (AKA Waver), can bolster Okita Souji’s damage by gaining more C. Stars and amplifying her Critical Strength. Mash on the other hand can serve as the source of Okita Souji’s defense. Oda Nobunaga can work well with Okita Souji also. With Okita Souji farming the C. Stars, Nobunaga can cast either Strategy to increase both of their NP Gain while she uses Demonic King to deal extra damage due to her increase C. Star Gather Rate and Critical Strength. Holy Night Sign would work well with Okita Souji as it not only improves the performance of her Quick Cards but also her Critical Attack damage. Since her Noble Phantasm – Mumyou Sadanzuki – is a Quick Type plus she has Shukichi, the effects can stack to have her deal heavy damage. And at the end of the chain, she can also inflict Critical Hit damage should the enemy still be standing. Since Holy Night Sign is also an event craft essence, it’s also one of the few that players may have on Maximum Limit Breakthrough. Gem Magecraft: Antumbra is more focused on bolstering her critical attack damage. Since she already farms so many stars and has Weak Constitution to increase her C. Star Gathering Rate, the Gem Magecraft: Antumbra will further bolster the damage regardless if Quick/Buster/Art card. Decapitating Bunny 2018 allows Okita Souji to pierce through the defenses of bosses that have evades, invincibilities, and etc. At the same time, the craft essence allows her to also increase the damage of her noble phantasm which can be stacked with Shukichi and Scathach‘s Primordial Rune. Riding E Increases own Quick card performance by 2%. Shukichi B 1 7 Increases own Quick card performance for 1 turn. Weak Constitution A 1 7 Increases own critical star absorption for 1 turn. Deals damage that ignores defense to one enemy. Reduces their defense for 3 turns. 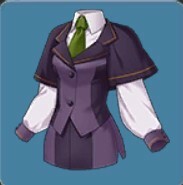 As the first captain of the elite Shinsegumi, Okita Souji prided herself in the ability to fight with concealed weapons. She is an elite swordsman that terrified those whoever she came to fight with. A genius swordsman, to conceal her original costume, she wore fashionable Japanese clothes. Majority of these fashionable Japanese clothes were the hakama used by many samurai during the Shogunate era. 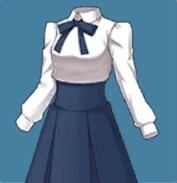 Despite her being a Saber class servant, she has pretty low magic resistance and endurance. The reason for this is the impression she first made on the masses coupled with her own illness that handicapped her against her opponents. 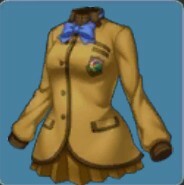 Until this day, she believes that she is a failure of the Shinsegumi due to her unable to fight with her comrades. Her only wish is to fight until the bitter end.